With the success of Game of Thrones, fantasy stories have increased in popularity and more importantly the success of Thrones and The Lord of the Rings have made fantasy respectable. Now, fantasy writers can be judged by the strength of their world building and their ability with prose. Peter V. Brett is an American fantasy novelist who has had success with his Demon Cycle series from which The Painted Man and The Desert Spear are currently available. Both are set in a world which is brought low by the arrival of demons that ravage the land, feeding on the populous. The only defence against these creatures are magic wards drawn on clothing, armour or skin. 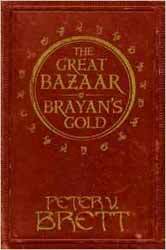 The Great Bazaar and Bryan’s Gold is a collection of two novellas set in the same world but at an earlier time to the novels illuminating some of the past history of one of the main protagonists, Arlen. Bryan’s Gold tells the tale of Arlen’s first real job as a messenger, a dangerous profession in this world as they have to travel overland, each night threatened by the demons which issue forth from the planet's crust. What should have been a quick overnight run turns into long run towards the mountains with a cart of unstable explosives destined for the mines, where legend says a snow demon lives. The second tale, The Great Bazaar, once again features Arlen, in his days as an apprentice messenger/proto warrior. This time he is crossing the desert in search of the fabled town of Baha kad’Everam, a Krasian hamlet. As important to the story is the introduction of Abban, whose station in life and personal weakness had made him a trader in a society of warriors, yet even trading can bring station and power. The book also contains maps, a small Krasian dictionary and a Ward Grimmoire, which has a picture of various wards with a description of their use. I have to admit to not having read the two main novels in this series, nor is it necessary to enjoy the two stories. Brett has a nice prose style which avoids all of the common errors in fantasy books; both the character and place names are pronounceable, I know it sounds like a small point but if you are creating a world populated by humans then giving everything unpronounceable names does not work for world building. I can see why the two main novels are popular; Brett is as interested in his characters as he is with the more fantastic elements of the stories. Arlen is a character which it is easy to empathise with, leading the reader to actually care what happens to him. This is only slightly diminished by the knowledge that the novellas work as a prequel to the main cycle and as Arlen is the main protagonist he is always going to survive. It’s a nice couple of stories, well presented and I’m sure a must have purchase for fans of the main novels, however it also works as a taster to the main cycle if you’re not sure whether to take the full plunge into Brett’s world.